At the title screen, type in your Name and click on Play. There’s no tutorial as it’s simple enough to get the gist of the game in your first round. You can choose from several game modes- Classic, Small Map, Fast Speed, Turbo, Slow Speed, Inverted Controls, Labyrinth and Create a Party or take on Challenges. 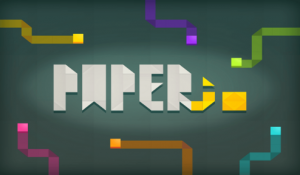 Paper.io sets you down in a map with other players and sends you in a random direction. You control your paper dot using the WASD keys for up, down, left and right. Completing the circuit and closing the loop gives you the space as your territory, but keep in mind that the open line is vulnerable against enemy attacks. Bump into open lines and avoid getting attacked to get high scores and climb the Leaderboard. Don’t hit the map’s walls or you will have to start over from the beginning. There are two ways on how to close the loop- go long and get a bigger territory or go short and conquer areas more quickly and with less risk. There are pros and cons in each; for instance, you’ll be exposed to greater risk when going long, while going short may be too conservative and you lose precious real estate. For first-time players, it’s better to go short and learn the nuances of the game rather than seeing the “Try Again” screen. As you get better, you can constantly scan the mini-map for nearby players while gobbling up as much territory as you can. Switching Skins every now and then injects fun and freshness in each round. Take a look at some of the offerings by clicking on the left-hand side. New Skins get unlocked by completing Challenges, by Sharing on Facebook or Tweeting about Paper.io on Twitter. When you’ve chosen, click on the Skin and wait for the check mark to appear. Challenges is a great way to hone your skills while earning extra rewards and getting a taste of the other game modes. If you’re tired of playing vanilla Paper.io, you can try the Turbo, which gives your reflex a nice exercise, the Inverted Controls for a mind-bending way to play or the Labyrinth, which makes you navigate through a maze. All of these offer extra content and makes for a well-rounded Paper.io experience. Want to play local multiplayer with friends? Paper.io has a dedicated Party Mode for that. Simply click the option at the top right side of the screen and a URL will appear. Copy the link and share it so your friends can paste it on their laptop PC or browser. Once everyone is in, click on Start and let the fun begin!